The name is what caught my attention – “Sumpter”. Henry Louis Gates, Harvard Professor and Presenter on the PBS series, Finding Your Roots, said to Tea Leoni, “Sumpter J. Daniel is your grandfather.” My head nearly snapped off as the camera zoomed in on a map of eastern louisiana. This all sounded familiar to me, a man named Sumpter living in East Louisiana. 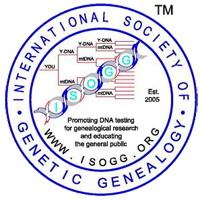 Before I saw the beautiful pedigree chart Henry presents on Teas’ grandfather, I had already guessed that the Daniels (O’Daniel) were probably connected to the families who had participated in the great Carolina Migration West. It is a story I know well because my 3rd great grandfather made the same trip with the Richardson Family. The children of the pioneers to Virginia left for greener pastures to the south, then their children left for greener pastures to the west. Why? The oldest child normally inherited the land or worked in the community. There would be nothing left for the younger children of the pioneers, so they moved on to be the next pioneers. “In the early 1700’s several of John Richardson’s children moved to the Cape Fear River area of North Carolina from Virginia, probably the Jamestown area. Around 1750 members of the family moved to Sumter District, South Carolina. Several of the South Carolina Richardson’s fought on the side of Francis Marion during the Revolutionary War. In the early 1800’s there was a rush of migration from the Carolina colonies to the West — which, at this time, was Mississippi and Louisiana. In addition to population pressures due to immigration and birthrates, the land that had been heavily farmed in the Carolinas was beginning to wear out and many people headed west to new land. In Dec 1808-Jan 1809, one of several Richardson brothers and a small party, including several slaves, trekked to southwest Mississippi — to what is now Wilkinson County — where they cleared land and put in a cotton crop. In the fall of 1809 they sold the crop, returned to South Carolina, packed up several other family members and “100 slaves” and returned to Wilkinson County, Mississippi, in January 1810 where they settled and prospered. 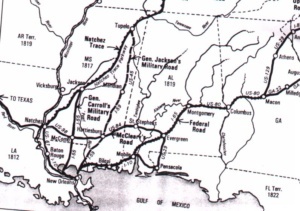 My Gauldens followed this route from Virginia to Sumter, South Carolina, following John Gauldens Father-in-Law, John Watson Brumfield, to his plantation in Sumter, South Carolina. Then his Children moved on to Louisiana. Carolina Migration from the north. John Gauldens daughter Martha married Francis R. Richardson. Francis R. was a part of the group who migrated through Native American Lands out to Eastern Louisianna/Western Mississippi. My 3rd Great Grandfather, Dempsey Gaulden traveled with his sister and her family out to Louisiana, sowed some wild oats in New Orleans and returned to South Carolina to continue my line of Gauldens. Sumpter Daniels family followed a similar path, immigrating from Western Europe, to Virginia, to Edgefield District, South Carolina. They were very close to where my Gauldens lived. 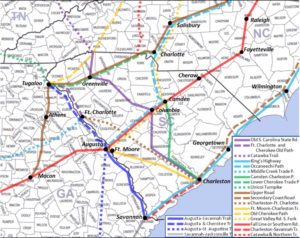 Map showing proximity of Sumter, Camden and Edgefield SC. Did the Gauldens/Richardsons and Daniels know each other? 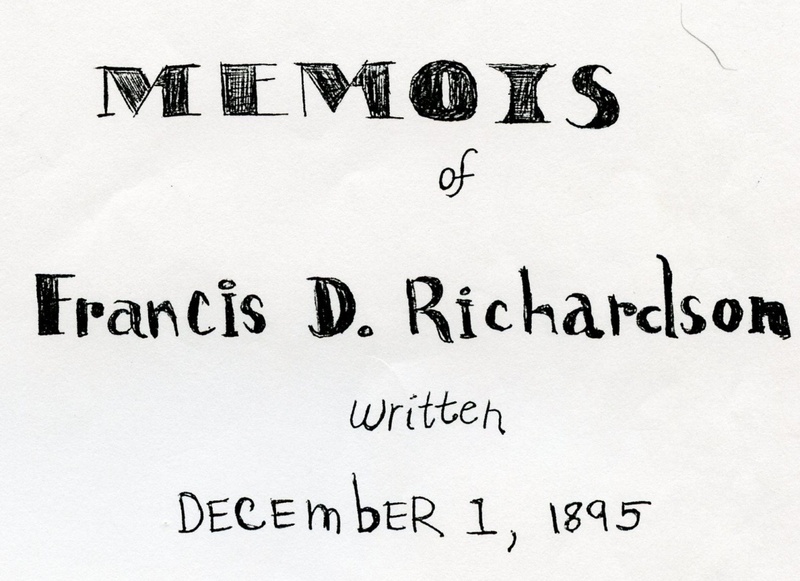 It’s hard to know unless Francis D. Richardson mentions the Daniels in his Memoir. But the fact that over 27,908 native born South Carolinian people lived in Mississippi and 4,583 native born South Carolinian people lived in Louisiana in 1850 might preclude any knowledge of each other. Because I know my family history, when I heard a similar story, I recognized in Tea’s family a story we share. Makes our world seem just a bit smaller.